All these hand held carpet cleaners are lightweight and compact, they can be used to both spot clean carpets upholstery. You can also clean area rugs and carpets with handheld cleaners. However to clean large carpeted flooring with one of these small carpet cleaners will take a lot of time and extra hard work. It goes without saying that handheld carpet cleaners are the most convenient gadgets for cleaning your car upholstery. Although at the moment of writing the Bissell Little green was the best selling small carpet cleaner; if we look at bare specifications the Rug Doctor portable small carpet shampooer seems to be a step ahead in the race for best small carpet cleaner for cars when compared to Bissell Little Green and the Bissell 1923 Spotclean. The Rug Doctor Portable Spot Cleaner weighs 9 kgs and has 1.9 litres clean water tank capacity. The cord length is a respectable 4.6 meters long. It has an inbuilt retractable handle and rolls on wheels for ultimate convenience. It is designed to fit squarely on any standard stairs. It has a motorised brush that enables you to deep clean spills and accidental mess. It is easy to store due to its smallish size. The thing that sets the rug doctor apart from its competitors is the double suction power that lifts off dirt from the root of the carpet and also removes excess water for quick drying of carpets. Among the three small carpet cleaner above the rug doctor is the more costly one. It goes for over 150 quid; while the Little Green goes for slightly under a hundred quid and the Bissell Spot Clean under 135 quid (These prices are accurate at time of wring but may change at any time. They are not the exact price tag but a general guideline of what each cleaner might cost). If your budget for a portable cleaner stretches to the 150 range, then the Rug Doctor might just be the best carpet cleaner for your car and spot cleaning. 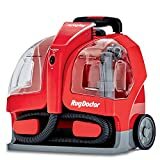 It has high suction, a removable nozzle which makes it easy to clean and maintain the cleaner and it rolls on wheels so that quickly wheel to the spot to be cleaned and back. The retractable handle increases the level of convenience. If your budget is in the 135 range, then you may want to consider the BISSELL 1923e SpotClean Cordless Cleaner. The BISSELL Little Green portable carpet cleaner 30K4E has more or less the same features as the top rated Rug Doctor Portable Spot Cleaner and yet budget friendly. See below a review of the Little Green to find out why we consider it the best lightweight carpet cleaner. This hand held carpet cleaner is popularly known as the little green machine. It is quite portable and perfect for spot cleaning. It has almost the same capabilities as a big carpet cleaning machines without the footprint of a bulky machine that can be difficult to store if you live in a small house. It has a 1.4 litre twin tank water capacity. It has a 4.6 meters cable length which is enough to cover a standard room. It also features an upholstery hose for cleaning your sofas/couches. This compact hand carpet cleaner can be used to clean carpets upholstery, car seats, pet stains and caravans. whenever you need to spot clean, all you need is to plug it on and start cleaning. Does not work very well in removing old caked stains, it is mainly good for spot cleaning fresh stains. It is hard work and consumes a lot of time when using it to clean large areas due to its small water tank. You have to clean the dirty water tank after use, otherwise it may start smelling. This cleaner though small cleans as effectively as any carpet cleaner both for large and small areas. It also has a powerful suction and spray that makes it quite effective in removing spills and stains. It is made up of recycled plastic and thus environmentally friendly. It is quite sturdy and works really well on low pile carpets and upholstery. It is perfect for car set cleaning, spot cleaning and dealing with accidental spills that could smudge your carpets. If you have dogs or cats, this is perfect for cleaning pet’s accidents on carpets. It has a good customer feedback and rating. 92% of the people who used it are quite happy with their purchase. It is arguably the top carpet cleaner for area rugs. The BISSELL 1923e SpotClean Cordless Cleaner has the smallest water tank of the three small carpet cleaners we have looked at. It has a 1.1L clean water capacity and is perfect for upholstery cleaning and cleaning car interiors. It has a lithium ion battery that can give you long continuous cleaning (20 minutes) that is why it’s called cordless. It is light weight. It weighs only 3.9 kgs and is easy to store due to its compact nature. It has the Heat wave technology that is patented by Bissell. The Heat wave technology blows hot air to the carpet to leave them touch dry immediately after cleaning. It has a tough stain tool for dealing with stains. Apart from the Heat Wave technology there is not much difference between, the the BISSELL 1923e SpotClean Cordless Cleaner and the Bissell Little Green that goes for less than 100.